Published: March 19, 2019 at 06:54 p.m. 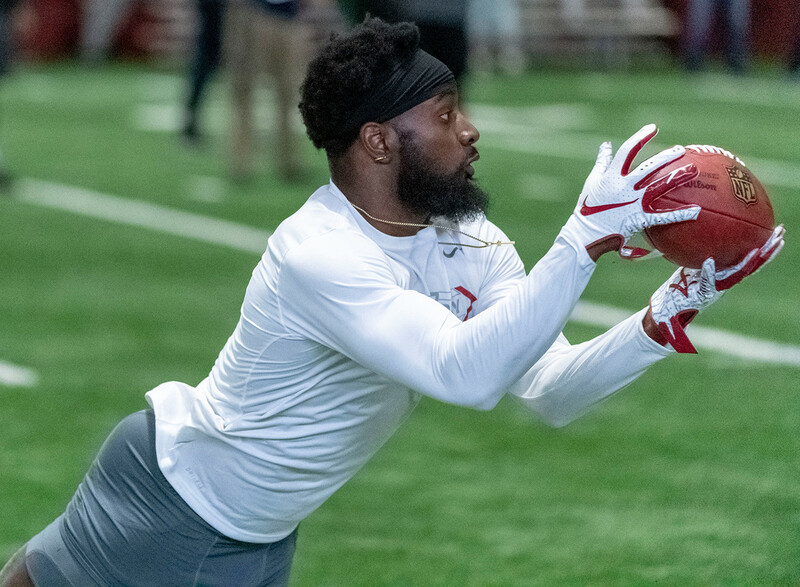 Updated: March 19, 2019 at 08:25 p.m.
Alabama welcomed the scouts to its 2019 pro day. Check out the highlights from this year's event. Alabama's D.J. Lewis works through individual drills at Alabama's pro day, Tuesday, March 19, 2019, in Tuscaloosa, Ala.
Alabama's Jonah Williams holds a blocking pad for Alabama's Joshua Casher at the Alabama pro day, Tuesday, March 19, 2019, in Tuscaloosa, Ala.
New England Patriots coach Bill Belichick, left, talks with Alabama football coach Nick Saban at Alabama's pro day, Tuesday, March 19, 2019, in Tuscaloosa, Ala.
Alabama's Christian Miller works through individual drills at Alabama's pro day, Tuesday, March 19, 2019, in Tuscaloosa, Ala.
Alabama's Damien Harris works through individual drills at Alabama's pro day, Tuesday, March 19, 2019, in Tuscaloosa, Ala.
Alabama's Derek Kief works through a drill at Alabama's pro day, Tuesday, March 19, 2019, in Tuscaloosa, Ala.
Alabama's Hale Hentges works through individual drills at Alabama's pro day, Tuesday, March 19, 2019, in Tuscaloosa, Ala.
Alabama's Jamey Mosley works through individual drills at Alabama's pro day, Tuesday, March 19, 2019, in Tuscaloosa, Ala.
Alabama's Josh Jacobs performs the vertical leap at Alabama's pro day, Tuesday, March 19, 2019, in Tuscaloosa, Ala.
Alabama's Ronnie Clark works through a drill at Alabama's pro day, Tuesday, March 19, 2019, in Tuscaloosa, Ala.